Boy, the month of May seemed like it lasted about 2 weeks. Hopefully June will stick around a little longer. In reading about this, I learned the term challenge coin. This seems to be well known to a) people who are in or around the military and b) possibly everyone else. But it was new to me. A rough version of the story is that challenge coins—medals, really—commemorate specific organizations or events and are issued to people who belong to the organization or participated in the event. The "challenge" part has a variety of apocryphal-sounding origins. One story is that a person could be challenged to show their membership in a group, which could be answered by producing the coin. Another story involves (what else?) drinking, where the person could be challenged to produce the requisite coin and would have to pay if they couldn’t produce one. 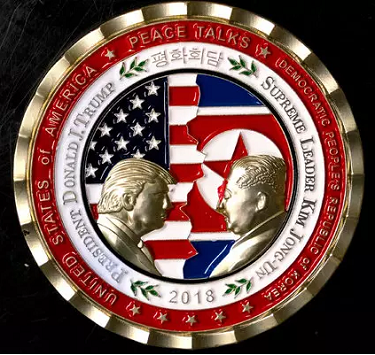 Although nominally a military thing, civilian organizations also issue challenge coins, which is how we get to the challenge coin commemorating the summit meeting. And you can now not just buy challenge coins (thus seemingly diluting its theoretical symbolic value), but heck, create your own. If all this was new to you as it was to me, you can read more about it in a Mental Floss article. For surprising word history, today I have yet another military term: shrapnel. Shrapnel refers to the bits and pieces of an exploding munition, or more generally, of an exploding anything. But it actually originally referred to a type of military shell that was explicitly designed to break into pieces in this lethal way. The more benign part of shrapnel is its etymology. Had you made me guess, I might have mused that it was somehow another military term we got from German (like flak and strafe). But it's not; it's an eponym: the Shrapnel shell was invented by a certain Major Henry Shrapnel (British) in the early 1790s. I wonder if it would be useful to have a term besides eponym to describe things that are named for people, but are also unpleasant: shrapnel, quisling, boycott, Draconian. Hmm. The notion of a permanent and transferable token serving as an authentication mechanism would not impress computer security experts, but we'll let that slide.